Jim is a saxophonist and multi-instrumentalist who has toured and recorded internationally with such world class performers as Sammy Davis Jnr, The Bee Gees, The Temptations, The Four Tops, Alan Broadbent and Mavis Rivers. Jim, is a guest soloist with the Prohibition Big Band, and is featured instrumentalist and featured soloist in the Prohibition Jazz Experience and the Prohibition Swingtet. He also leads and plays in a number of other New Zealand Bands and occasionally records and plays in New York. Jim also recorded and broadcast a program on flute and alto flute with the Russ Garcia Jazz Orchestra. Jim has tutored at the New Zealand School of Jazz and the University of Auckland and also gives private lessons on saxophone and flute. 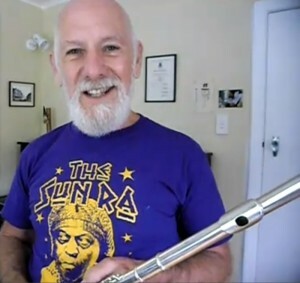 During a discussion in 2011 with friend and editor of Flute Focus, Mary O’Brien, on how easy or difficult it was to learn to improvise and to teach someone to improvise, Jim argued that nearly any musician could learn in under ten minutes and to make his point, picked up his flute and demonstrated how it could be done. Mary proceeded to film the demonstration on her cell phone. Her husband Maurice did the uploading. After more than 5,000 plays over the last two years, Jim agreed to video and post additional videos, which he recorded with piano accompaniment by Mary and Maurice’s daughter Charlotte. The series was filmed by Maurice in Jim’s Studio. Jim Langabeer and Charlotte West explain and then demonstrate how to improvise using basic chords. The 6 videos in this series start with this Introduction, then moves to Warming Up and playing. Feel free to join in as Jim warms up then improvises his first tune using these chord sequences. In this 3rd video in the series, Jim explains the chords in more detail. Now we have warmed up and are comfortable with the chords, in video 4 it’s time to start grooving. As Jim says, it’s all about having fun and seeing where it takes you. Now’s the time in video 5 of this series to extend the chord sequences with a few more and jazz it up a bit. In the final of this 6 part series, Charlotte plays a piano accompaniment so you can try your own ideas. Go crazy, now’s the time to see how it all works for you.